Get your FREE reading and spelling activities! Complete the form for instant access to your "Winter Practice Activities." 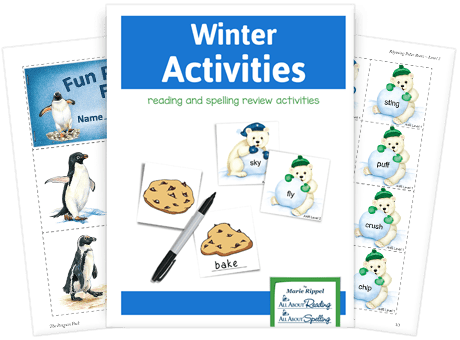 Add some fun to winter reading and spelling lessons with these three hands-on review activities, suitable for all ages and levels with these three hands-on review activities, suitable for all ages and levels. 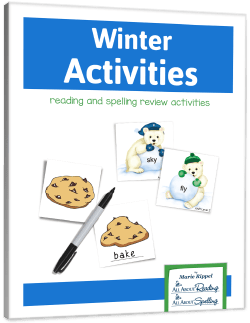 Cookies, polar bears, and penguins provide an exciting and motivating way to beat the winter blues and help your child to practice their reading and spelling skills. Bake the Cookies - your child will “bake” yummy desserts! Rhyming Polar Bears - match up the pairs of rhyming polar bears. Fun Penguin Facts - your child will make his very own 18-page penguin fact book. Each of these activities can be customized to be used at your child's pace and level of learning.